Lean IT is the extension of Lean manufacturing and lean services principles to the development and management of information technology (IT) products and services. The Lean concept is evolved from the production processes of Toyota (1950). Companies will minimize waste and produce high quality with the Lean method. By applying the Lean method they increase efficiency and increase customer value. The Lean concept has a great impact on the culture of an organization with behavioral aspects such as empowering employees to involve them in the optimization of processes. Lean also introduces new concepts such as: Just in Time and Continual improvement. Organizational benefits are:  Reduce costs via process efficiency  Maximizing customer value Benefits for employees are:  Lean IT is complementary to other frameworks such as ITIL  Broaden skills on process efficiency with a strong emphasis on behavior  Employee satisfaction increases (involvement) Target group Management and employees of any organization planning to introduce lean need to have a basic understanding of lean thinking. There are no pre-requisites for candidates wishing to be trained and examined for this qualification. However, It is strongly recommended that candidates:  Have gained two or three years of IT-professional experience in the fields of support and maintenance and/or software development. Candidates could also be project managers or line managers in an IT organization.  Participate in a training course through one of EXINs accredited training providers. 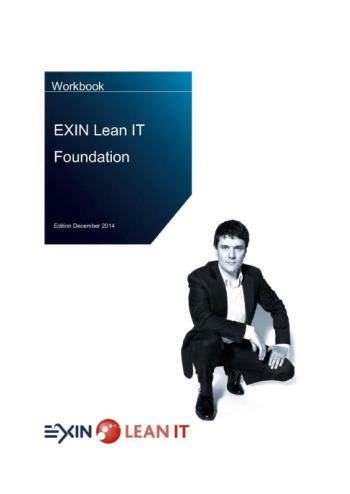 Context Lean IT ties in well with other EXIN examination programs, such as ITIL and EXIN IT Service Management based on ISO/IEC 20000. Lean IT optimizes your IT Service Management processes.